You have no doubt experienced the frustration of backing up to hitch a fifth wheel. If you have a truck box you are also familiar with almost no visibility into the bed of the truck, so you cannot see the hitch to line it up. Over the years Fifth Wheel owners and manufacturers have come up with a few fixes to try and make the hitching job easier. We have the colored tape in the middle of the fifth wheel pin box and then the colored tape on the truck box or on the hitch. Line these up and hitching is supposed to be easier, but alas that is not the case. With the driver seat off to the side of the tape, it is often difficult to line up the tape and multiple tries often result. In the dark this is of no use at all and if one has to hitch at an angle due to lack of space, again the tape is of no use. We have the hitch hook-up backup mirror on the Fifth Wheel cap, which is supposed to help backing up, but again not so easy at all, and useless at an angle or in the dark, and really does not help to line up the hitch and the pin. Then we have the jack rabbit approach. Reverse, hop out and see if we are lined up, reverse some more, hop out and see if we are lined up, pull forward and line up again and so on. Simply place one cone in the truck bed aligned with the center of the hitch and then back the cone tip up to the RV pin box. The RV pin will now be perfectly aligned with the center of the hitch. The physical reference point of the cone makes backing up amazingly simple. No matter the angle you are coming toward the pin box, simply back the cone up to the pin. For angled hitching you can place one cone on the truck tailgate and one cone closer to the hitch, so it is even easier to line up the pin to the hitch. The pin box will push the first cone over and then be perfectly aligned on the second cone ready for the pin box adjustment to the correct height of the hitch. Any safety cone will do, we found a collapsable lighted cone and use that. If you have a truck box a tall cone is better for visibility from the cab. If you need to stop on the side of the road for any reason the cones are perfect as a safety precaution, day or night. 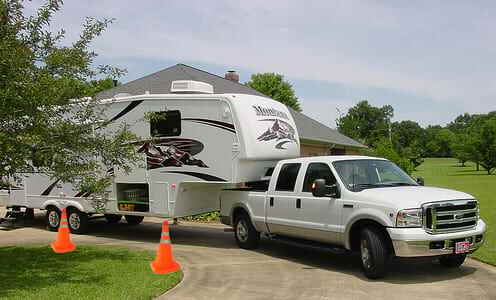 The high visibility cones are extremely helpful when backing into tricky RV sites. Use them to mark the point when a tight turn should be made. When the rear of the RV or RV wheels line up with the cone then the driver knows to start turning the RV into the site. They can also be used to align with the sides of the RV site and then back the fifth wheel between the cones ensuring perfect site alignment, especially when the site has a concrete patio area and the RV wheels need to be beside it. One of the biggest problems with backing a large fifth wheel RV is a lack of reference points. The cones provide visual reference points to the driver. 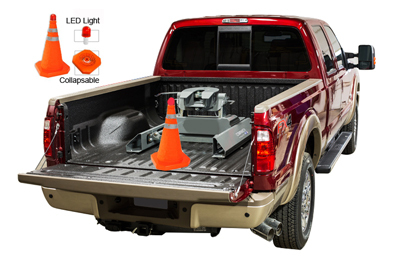 The lighted cones are extremely useful at night when backing up and can be seen in the truck mirrors for a good distance.